Sax is a small town which can be found inland on the Northern Costa Blanca in Spain. The nearest airport is Alicante Airport which is forty-nine kilometres away with a travelling time of approximately thirty-five minutes. Archaeological findings state that Sax dates back as far as the Bronze Age and there are also the remains of an Iberian necropolis and some Roman villas. Today visitors to Sax come to see the fortresses, Sax Castle and the 16th century Church of the Assumption. Sax has rail links with Alicante so it is easy enough to catch the bus to the city centre and connect directly with the town. Sax has quite a substantial expat population who prefer to live in quiet country fincas as opposed to the often over crowded hectic tourist resorts. Sax is quite a small town so currently there is only one hotel which is the Hotel Fuente el Curo. Driving towards El Chorillo and Elda there are some more hotels which include the AC Hotel Elda by Marriott, Hotel Santa Ana and the Hotel Restaurante Salvadora. Restaurants to eat out at that have been recommended by the Trip Advisor include The Landgasth of Schlossli Sax and El Nuevo Guretxoko. Sax is a great area for hiking and walks through the El Plano pine forest which is home to an estimated one million pine trees. Benidorm with its nightlife and theme parks is thirty-five kilometres away or roughly twenty-five minutes by car. Sax makes for a great day out to experience a more authentic part of Spain. Claire, what would you say would be the advantages to living in Sax compared to other Costa Blanca towns? Sax is a very pretty, affluent and thriving inland town with excellent amenities and transport links to all the major road networks and is only about 30 minutes inland from Alicante airport and the beaches. Just off the A31 Alicante to Madrid road, it also benefits from rail and bus links to Alicante and Madrid. It has a wealth of shops, bars and restaurants, an indoor and outdoor swimming pool, parks, a theatre and a town square. There is a weekly market on Mondays selling locally produced fruit and vegetables, plants, clothes and shoes. The people of Sax are very friendly and welcoming. They take great pride in their history and tradition and local fiestas (of which there are many) are always “must see” events with everybody participating with great gusto. 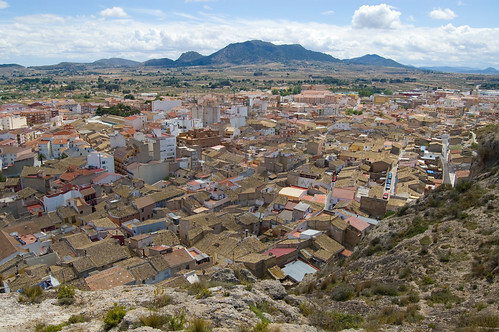 It has a population of about 11,000 people and is predominantly Spanish, but has a good mix of ex-pats of various nationalities, so there is always someone around to help if your Spanish isn’t great. However, there is a very good Spanish teacher and it’s well worth making the effort to learn some basic Spanish in order to make the most of everything that’s going on. Can you name some of the area’s most popular places? The town has many monuments and beautiful historic buildings, not least of which is the restored castle, which sits precariously high overlooking Sax. When it is lit up at night it appears to float above the town. Built by the Moors in the 10th century, the castle, whose foundations are built over a cave, dominates the town and there are free guided tours by appointment every Sunday at 11 a.m.
Steeped in history, there is archaeological evidence that settlements existed in prehistoric times and the town has been ruled by Romans, Moors and eventually Christians. The historic part of the town has narrow winding streets and there are lots of historic architecture including the 16th century church of the Lady of the Assumption, the chapel of Ermita de San Blas, lots of snow pits that date from the 13th century, which are up to 15m deep and were built of brick to store snow in the winter for use in the summer for food storage. Mainly an agricultural town, Sax is renowned for growing grapes for wine production and there is a working bodega that processes the grapes and olives. The co-operative shop sells Sax wine and their own olive oil. More recently Sax has been important for its shoe production and leather goods. There is also a state of the art 24 hour medical centre and Elda hospital is just 5 minutes away. Sax has everything you can need for day to day living and there is a recently built hotel which is ideal for people to stay at to explore the area. The hotel has an excellent restaurant and there are many other tapas bars and restaurants offering a wide range of food. Sax is a busy town all year round, not a tourist resort so it doesn’t go quiet in the winter and get over – run with tourists everywhere in the summer. There are lots of things to do and Sax has its Moors and Christians fiesta in the first week of February each year. Everybody participates and it takes place over four days with the last day ending with the storming of the castle in the town square. The residents of Sax take great pride in the town and it is very clean and safe. The nearest international school is in Alicante, but most expats enroll their children in to the local state schools which have a “buddy system” with a bilingual child teaming up with a new pupil to help while they learn the language. The local schools have a good reputation and it also means that the children integrate better and make friends in the area. The property market has started to recover and prices have bottomed out in Sax. However, being a little inland from the coast, Sax offers very good value for money, with fully furnished apartments from 30,000 euros, renovated town houses from 35,000 euros and villas with pools from 125,000 euros. The small village of St Eulalia is close by and has lots of old buildings to explore. There is also a Spanish soap opera filmed there. Any tips and advice to people looking to buy in Sax or surrounding area? Fabfincas was established in 2005 by husband and wife team Steve and Claire Wells. We are a fully legal, professional, independent estate agency. We pride ourselves on listening to our clients needs and aim to make property hunting enjoyable, informative and stress free. We are here to help with all aspects of purchasing a property and our aftercare service is second to none. Claire, thank you so much for taking the time to help our readers with your experiences in Spain. If you want to contact her, you can find her details below. Below is a video showing some of the popular places in Sax. just a little point benidorm is a one hour drive from sax,not 25 minutes..otherwise good review.